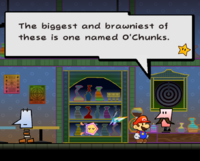 Carson is the owner of The Overthere, the coffee bar (described in-game as a "beveragarium") in Flopside in the game Super Paper Mario. For ten coins, Carson will tell one of approximately fifteen stories he has collected over the years. They range in scope from the Pixl uprising to Count Bleck's minions. If the player does not have enough coins, has listened to all of Carson's stories or does not accept the 10 coin charge, he will tell one the player has already heard before for free. His Flipside counterpart is named Garson, and while Carson sells coffee, Garson only sells milk at his bar, The Underwhere. Both establishments are name after the realms of the dead as seen in Super Paper Mario, The Overthere and the The Underwhere. Carson and Garson take the roles of Russ T. and Wonky from the past two Paper Mario games. The original Paper Mario's Russ. T offered much more information throughout the game and would tell it for free, while in the sequel, Wonky had a wider range of topics and would tell them for five coins. So the Ancients build the town in a way that would stabilize this effect. And that particular way was... Do you know what? The town was build in duplicate with both Flipside and Flopside versions! They realized that light without dark, or vice versa, would never be stable. You need both sides for perfection, you know? Having two opposite sides is the secret of the town's stability and longevity. So you heard the famous charmer Merlee moved into Flopside somewhere, right? If she casts a charm on you, good things happen when you beat enemies. Try it! ...Oh yeah. But I hear that something's been bothering her lately. If you talk to her directly and not across from the ball, she'll tell you about it. If you have some free time, why don't you go see what's going on with her? So Count Bleck has four minions, does he not? The biggest and brawniest of these is the one named O'Chunks. So about this O'Chunks... He was once the general of an army in a certain land... I hear he led a force of a thousand strong across enemy lines. But one of his trusted advisors sold him out... And all of his men fell to the enemy. I guess that's when Count Bleck scooped him up. So have you heard of the Tribe of Darkness? Nolrem and others like him are descendants of this shadowy, odd people. Long, long ago, they broke off from the Tribe of Ancients to live alone. They avoided mixing with other people out of pride... And no one even knows where they went to live, they were so secretive. Others say she's the unintended creation of a witch... A witch who was researching potions that would allow shape-shifting... If you ever meet her, could you ask her for me? One day, they all just disappeared from the Tribe of Ancients... And since then, no one has seen them... Did their games end? All is now shrouded in darkness. So Count Bleck has four minions, as you know. I hear that one of them, Dimentio, wields powerful magic. I don't know where he comes from or who he is... But I hear he approached and befriended the count all on his own. And the count even turned him away once... Until he read in the Dark Prognosticus about the role of someone similar... Why was he mentioned in the Dark Prognosticus? Sounds fishy to me! So let me tell you more of the Tribe of Darkness, and why few talk of them... They did something so bad that mentioning them has become forbidden. So as you know, Count Bleck has four minions. One is an authoritative young woman named Nastasia, his right hand. She has the ability to brainwash people by looking them in the eyes. She can enslave even very powerful beings this way. And it seems none of the count's underlings can resist her power. That's how she's been able to order them around. So have you heard of the Pits of 100 Trials below Flipside and Flopside? I hear they were created long ago to test the forces that guard the Pure Hearts. The Pit of 100 Trials here in Flopside was used to study the powers of darkness. I don't know exactly what that means...but it sounds pretty terrible. There's even a rumor that treasure awaits those who make it to the bottom. Do you have the courage to find out for yourself? 'Once upon a time, a man went to look for the girl he loved, who was missing. As he passed through a forest, he found a bat stuck in a trap. He set the bat free. It promptly thanked him and disappeared. The last part of the story was... 'The bat pledged eternal loyalty to the man out of love on that night.' ...And that's the end of the story. I wonder what happened to those two? If there's more to that story, then I'd like to hear it. So do you know how the Pixls came to be? A powerful magician among the Ancients created them about 3,000 years ago. He did it by transferring a spirit into a vessel he created for that purpose. He's said to have created 12 Pixls like this before he passed away. But his apprentices kept researching Pixls after his game ended... They learned to create many more Pixls based on his original 12. These Pixls became widely used as 'thinking tools' for the grateful Ancients. Through the work of many Pixls, the Ancients prospered as they never had before. So have you heard about the Pixl uprising? It happened in the capital of the Ancients some 2,000 years ago. The Ancients lived in prosperity thanks to the work of many Pixls... But one day that all ended. A huge Pixl calling herself the Pixl Queen suddenly appeared... At her command, Pixls everywhere rebelled against their Ancient masters. It seems that most Pixls were well-contained spirits, but she was different. In her case, a demonic spirit was contained within a Pixl vessel. And this queen Pixl had the power to command all other Pixls. The Ancients had become so dependent on the Pixls. They were devastated... They suddenly lost their ability to build and rule their empire effectively... ...And what happened then, you ask? Come back for the next installment! The Ancients were overthrown and enslaved by the Pixl revolt led by the Pixl Queen. In the midst of the ruin appeared the inheritors of the twelve original Pixls. They defeated the waves of Pixl soldiers and freed the enslaved Ancients. They used Catch Cards to trap the mind-controlled Pixl soldiers, then healed them. They saw their friends fall one after the other in battle, but they persevered. The last survivor managed to make it to the castle of the Pixl Queen. But the Pixl Queen used her powers of illusion to hide. She then unleashed horrific images upon the surviving freedom fighter. Oh...Looks like the coins you paid will only get you this far through the story! The master magician had made her after studying the Dark Prognosticus. So when the last surviving apprentice took the Dark Prognosticus from the queen... He decided to disappear with the book so that this sort of catastrophe wouldn't repeat. But even as peace returned, the Ancients could not lose their fear of the Pixls. So, the elders among the Ancients gathered to discuss what to do. They decided to limit the powers of all Pixls from that day forth... And the creation of new Pixls was outlawed. But, as a result, the power and influence of the Ancients began an irreversible decline. Now the secret of Pixl creation is lost forever. Though rumors abound of awakened Ancients and newly created Pixls... Is that true? If you know anything about it, please tell me! Perhaps he transferred her spirit to a Pixl vessel? ...Well, that's the theory. Is it possible the other Pixls were spirits from the game-overed? ...Anyway, the person who published this has already disavowed that theory. I mean, it does seem a little unlikely, right? But if it WERE true... I'd bet the daughter was so horrified by the deeds of her father... That she wanted no one to ever use Pixls again.